Mommy on the Money, The Stuff of Success, Barbara’s Beat, Libby’s Library, Capri’s Coupons, Couponing4you, A Little Bit of Everything, Simply Sherryl and Uplifting Love. Disclosure: NYSavingSpecials is responsible for prize. If you have any question about this giveaway please send an email to nysavingspecials@gmail.com. All entries are optional, if you do any of the tasks with multiples entries, even if you do one entry you can get the extra entries,. but if the winner tasks is a tasks you did not complete, a second winner will be chosen. If the winner tasks is the one you did you will be the winner. Shopping for kids can be pretty tough; you want clothing that’s durable yet comfortable, and looks great at the same time. Well, with Reebok’s new kids apparel line, they’ve got you covered! With shorts, t-shirts, compression tops, hoodies, and fleece, the new Fall line of kids Reebok apparel on is perfect for school and for play. Fit out your boys for fitness with the Alright Tech Top. The interlock construction offers durability and stretch, while the contrast details add sport-ready style. In great colors like sonic green, black, and blazing orange, this lightweight shirt is perfect for layering, playing, and studying. To match the Alright Tech Top is the Trainer Pant! Designed for warm-ups, fitness, and everyday style, the kid-friendly Trainer Pant features a durable double knit construction and convenient side pockets for storage. And for the girls are the compression fit Strong Teck Top and the Abigail pant, just to name a few. These items will help keep girls warm while still allowing for maximum mobility! Fitted to a girl’s style and strength, the compression fit Strong Teck Top features mesh inserts for breathability, thumbholes for support, and raglan sleeves for sportier draping. Don’t forget to complete the outfit with ATV19s, customizable to your own liking. CLICK HERE and get creative today. Scattering bowling pins is a harmless way to release aggression, much like doing needlepoint in all caps. Bowl your heart out with this Groupon. Play’s prices vary throughout the week. 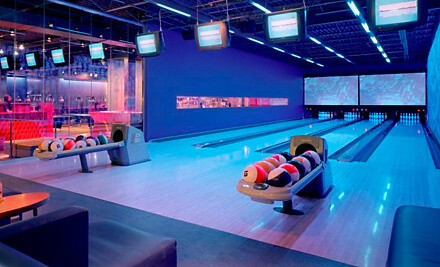 Though Play is equipped with four Brunswick bowling lanes, the sleek venue’s diverse amenities keep it from being categorized as just a bowling alley. Guests can demonstrate their hand-eye coordination at six pool tables, three ping-pong tables, and an air hockey machine. For a more electronic entertainment fix, patrons can conquer new kingdoms in the Xbox enclave or sit astride a mechanical bull. In Play’s lounge area, clusters of dangling lights illuminate colorful couches, while patrons in the VIP Lounge sip pours from a 72-foot stainless steel bar long enough for a full-grown anaconda to lie down for body shots. American cuisine from the full-service restaurant complements libations, which can make guests at ping pong parties, bowling parties, and dance parties the opposite of thirsty.